I am a big advocate of evangelism as a lifestyle. When I read the book the Acts, I see how evangelism played out in the life of the apostles and early believers. They spent time with people. They shared their faith, and the “Lord added daily” to their numbers. How can a believer experience a lifestyle where evangelism occurs in the ordinary routine of life? The principles Cecil maps out could help the ordinary believer find ways to incorporate evangelism during the ordinary course of life. This is a practical and accessible book, not overly academic or dry. As he goes through the book, Cecil is good at including appropriate stories and biblical references. The stories come from his own life. Cecil starts recognizing that evangelism starts out of your own relationship with Jesus. (Principle 1). Without nurturing your own relationship with Christ, you’ll lack any passion or motivation to share. Like many writers, he starts with defining evangelism. 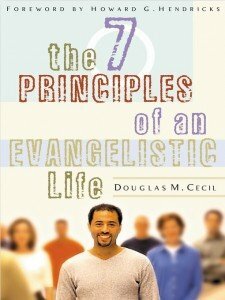 Cecil clearly defines evangelism as the particular conversation where the gospel is shared. For Cecil, evangelism is an event in the process of disciplemaking. On the one hand, I agree with his definition of evangelism. A strict biblical interpretation of meaning of evangelism would be the actual proclamation of the gospel. On the other hand, I would see all the appropriate activity and conversations leading up to that particular moment as part of the evangelistic process as people walk through stages of their journey to Christ. He would call that “witnessing.” It’s a slight difference of nuance. There is a great commandment before there is a great commission. You may have the slickest method, the slickest presentation, and be the most silver-tongued person around; but if your relationship with Jesus Christ is out of focus, evangelism is out of balance. (Location 276). The people in the relational-strategy camp talk a lot about the cultivation and talk little about the harvest. The writers in the aggressive-strategy camp talk a lot about the harvest, but talk little about the cultivation. Normally a person has to choose between one of the two strategies. It seems to me that both are correct, if properly employed. We ought to target some sort of middle ground where we see the two united with such terms as cultivation, sowing, and harvesting. There is a proper time for cultivation, a proper time for sowing, and a proper time for harvesting (Location 496). 3. Make the gospel clear. 4. Evangelism is more spiritual than methodological. 5. Being a good witness means passionately pursuing the lost in love. 6. Evangelism moves forward as God’s people get involved in ministry and service. 7. Disciple, nurture, and assimilate new believers into the church. Follow-up is the process of establishing a believer in the faith. Notice two things about this definition. First, follow-up is a process and not just an event. We never arrive in follow-up. Secondly, the person being followed up may or may not be a new believer. There are a lot of people sitting in our pews who have never effectively been followed up. (Location 2723). Keeping the passion for evangelism going. How we live serves as a foundation for evangelism, not as a substitute. The greatest obstacle to [evangelism] is the church that is preoccupied with its own existence. Being a witness is passionately pursuing the lost in love and being intimately involved with people. Doing evangelism centers on proclaiming that Christ died for our sins and arose from the dead. I believe that the Father’s heart is expressed in three ways: a concern for the world, a compassion for the lost, and a passion for reconciliation. If you just feel compassion without showing mercy, then you really have not experienced biblical compassion. 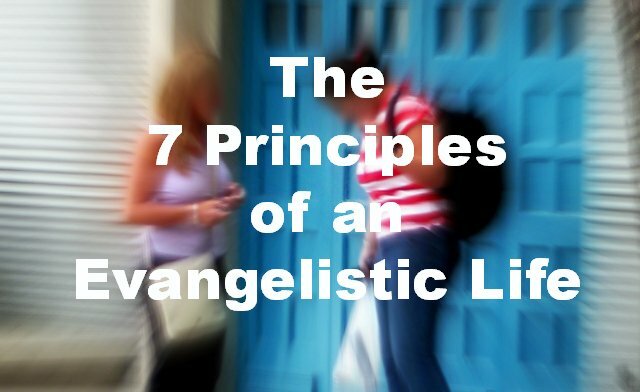 Until the Gospel is actually presented, evangelism has not truly occurred. It is good to keep in mind that all relational strategies must become aggressive at some point; otherwise, that person is still lost. You start by being a good witness for Jesus Christ. But what exactly is a good witness for Jesus Christ? Being a good witness is being salt and light in a tasteless and dark world by living by grace and truth. 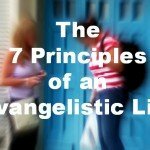 Order your copy of The 7 Principles of an Evangelistic Life from Amazon. I will receive a small commission. Doug Cecil is the author. Outreach Magazine compiled a list of 33 influential books in the March 2012 edition. I see that I need to catch up on my own reading. Using great questions to help a person discover their thirst and need for Christ. So I’m always on the lookout for great conversational tools and training to help Christians grow more comfortable with sharing their faith. I’ve personally shifted from seeing evangelism as only a one way proclamation event to a multifaceted process of a series of events that add up to a person’s decision to surrender to Christ. Many conversations are a key element in a person’s journey to Christ. 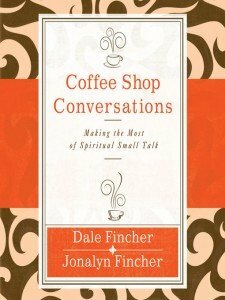 In Coffee Shop Conversations: Making the Most of Spiritual Small Talk, authors Dale and Jonalyn Fincher intend to help Christians gain the right to be heard through genuine care and concern for those God places in our lives as we go about our daily activities. How does a Christian have normal conversations about Jesus without accidentally sounding offensive, bigoted or intolerant? 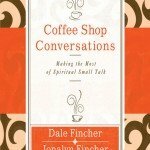 The first section of Coffee Shop Conversations: Making the Most of Spiritual Small Talk focuses mostly on principles of spiritual conversation. Principal #7 was a great one: Allow people to remain unconvinced. Learn to ask more questions and not be afraid to learn from the person you are talking to since questions open up the possibility of meaningful conversation and honest engagement. The authors also point out conversation stoppers that have killed their own conversations (chapter 3). Don’t fallback on that’s-the-way-I-was-raised answers. When feeling fearful or threatened, lash out hatefully. Show your disgust for the other person or his views or situation in life. Sniff out their sin, and then club them with shame and blame. The second section includes chapters on discussing our faith in particular in contrast with spiritual themes in our culture. This will date Coffee Shop Conversations: Making the Most of Spiritual Small Talk as they tackle four popular books from the last few years, like The Secret. But the principles they lift out will remain valid for having conversations. They provide more examples of ways to engage others in dialogue about faith. This final part of Coffee Shop Conversations: Making the Most of Spiritual Small Talk deals with common questions and topics that might arise in spiritual conversations. For example, the problem of pain and suffering is one that different religions handle with vastly different ideas on the solution. They raise the question of evolution and other red herrings that distract people from focus on Jesus. Some of these are attributed to a particular “brand of Christianity” rather than basic foundation truths about following Jesus. Some theological streams will take issue over what issues the authors molehills and mountains. Overall, the book was a decent read. At times I felt like Coffee Shop Conversations: Making the Most of Spiritual Small Talk drifted, allowing quick skimming of certain sections. As a strength, it focuses on conversational principles and points the reader on skills to grow your spiritual conversations. This is not a book on how to memorize and present a gospel formula – its goal is not to teach you a script or presentation. Rather, their stated goal is to help you have more conversations that can open the doors to that gospel sharing down the road. For those that believe in proclamation via monologue presentation before relationship – Coffee Shop Conversations: Making the Most of Spiritual Small Talk won’t work. For those that want to grow in their conversation skills, Coffee Shop Conversations: Making the Most of Spiritual Small Talk gives several suggested ways to grow more comfortable in your conversations. Order your copy of Coffee Shop Conversations: Making the Most of Spiritual Small Talk from Amazon (affiliate link). On a message board that I frequent, a user asked for a review of Becoming a Contagious Christian, by Bill Hybels and Mark Mittleberg. 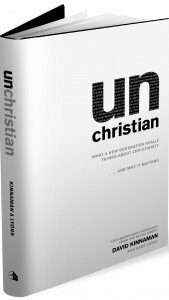 This week, I’ve been reading unChristian: What a New Generation Really Thinks about Christianity… and Why It Matters. It is the fruit of a 3 year study of perceptions that those not it in the church have about Christians and the church. Simply put, Christianity has an image problem. “Christians no longer represent what Jesus had in mind, that Christianity in our society is not what it was meant to be” (p.15). 38% of those surveyed (2 out of 5) have had a “bad impression of Christianity” and 1/3 said that Christianity represents a negative image with which they would not want to be associated (p. 24). Another lesson learned from the research is that “Christians have become famous for what we oppose, rather than who we are for (26). The next chapter of the book looks into the most common points of skepticism and objections to Christianity. Inside each chapter is an analysis of of the theme, and how the church can reshape the perception. For example, the term “Sheltered.” The perception is that “Christians are boring, unintelligent, old-fashioned, and out of touch with reality.” The solution is to reshape that perception as “engaged, informed, and offer sophisticated responses to the issues people face” (121). But reshaping is not playing with semantics. The book is a call to action and provides practical steps and suggestions for pastors, church leadership, and lay people. As you seek to engage people around you, this informative book will help inform you as to some of the reactions that people may have and how to respond to them. 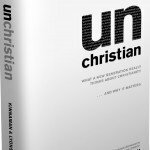 Order your copy of unChristian: What a New Generation Really Thinks about Christianity… and Why It Matters from Amazon.